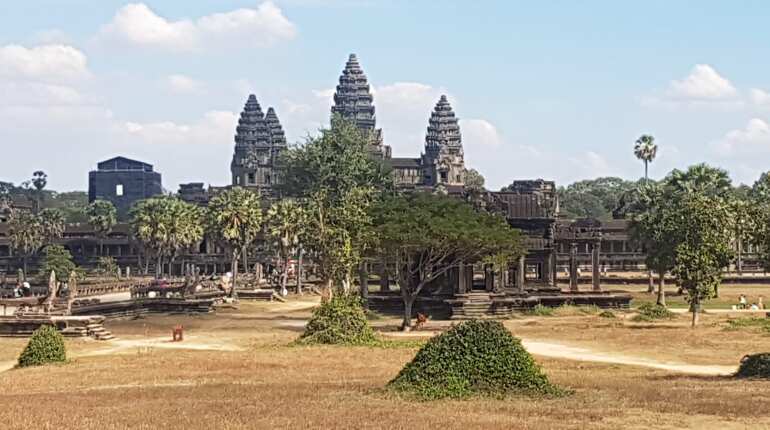 The temple complexes in northwestern Cambodia not only co-exist with Buddhist iconography but also influence the cultural life of the country. Angkor Wat and Angkor Thom are two temple complexes in northwestern Cambodia's Siem Reap. The walls of the two complexes have a brilliant display from the epic tales of Ramayana and Mahabharata. The beauty in the wall is reflected in the detailing. 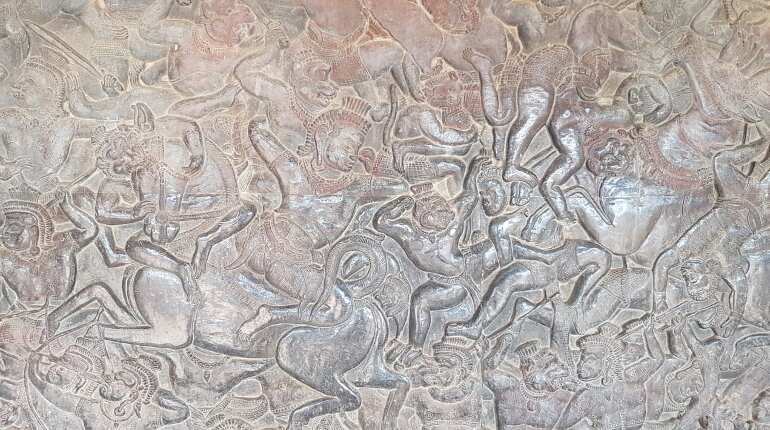 The walls of Angkor Wat have a full illustration of both epic tales Ramayan and Mahabharat and the Samudramanthan which is known as the tale of churning of the seas from which both celestial nectar and poison came out. 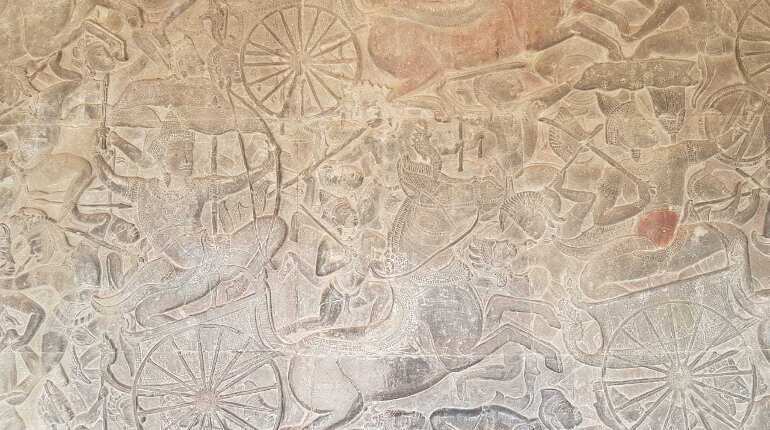 The walls have a detailing from Ramayana of the fight between monkey king Bali with Sugreev and Lord Ram taking a position to go for a kill. The walls also narrate stories from Mahabharat showing Bhishma being pinned by Arjuna’s arrows and the vicious detailing of the 18-day battle. The tale of Narasimha avatar which recites a fight between a devotee called Prahlad, his daitya (monster) father Hirnakashyap and Narasimha avatar of Vishnu is also reflected on the temple walls. Though the tale is quite popular in India, the temple only finds a place in South India and not North India. The walls of Angor Wat, however, describe a story from the Narasimha tale. Wall of Samudramanthan in the temple complex shows Hanuman with tail of Sheshnag and Yama sitting on top of Nandi. In Siem Reap both Buddhist and Hindu influences have been illustrated for tourists. Some parts of the temple complex in Siem Reap have been maintained and restored by the ASI. 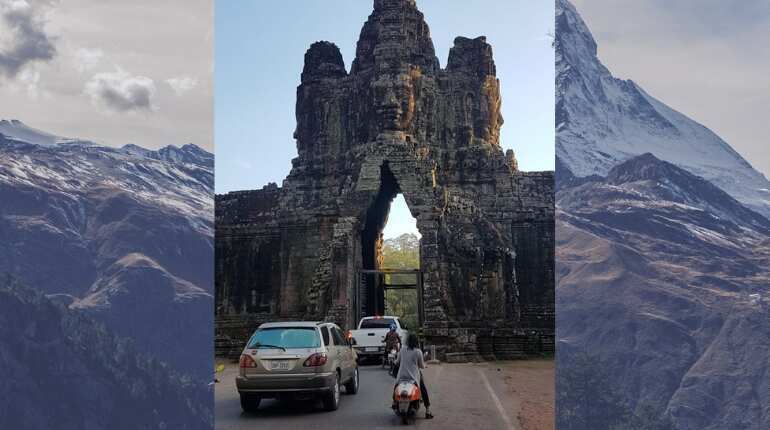 Modern traffic passes through an ancient monument. The complex is clean and neat and habit of not littering is encouraged.